This article is about the general concept of hydropower. For the use of hydropower for electricity generation, see hydroelectricity. It has been suggested that hydroelectricity be merged into this article. (Discuss) Proposed since November 2018. The Three Gorges Dam in China; the hydroelectric dam is the world's largest power station by installed capacity. Hydropower or water power (from Greek: ὕδωρ, "water") is power derived from the energy of falling water or fast running water, which may be harnessed for useful purposes. Since ancient times, hydropower from many kinds of watermills has been used as a renewable energy source for irrigation and the operation of various mechanical devices, such as gristmills, sawmills, textile mills, trip hammers, dock cranes, domestic lifts, and ore mills. A trompe, which produces compressed air from falling water, is sometimes used to power other machinery at a distance. In the late 19th century, hydropower became a source for generating electricity. Cragside in Northumberland was the first house powered by hydroelectricity in 1878 and the first commercial hydroelectric power plant was built at Niagara Falls in 1879. In 1881, street lamps in the city of Niagara Falls were powered by hydropower. Since the early 20th century, the term has been used almost exclusively in conjunction with the modern development of hydroelectric power. International institutions such as the World Bank view hydropower as a means for economic development without adding substantial amounts of carbon to the atmosphere, but dams can have significant negative social and environmental impacts. Saint Anthony Falls, United States; hydropower was used here to mill flour. In India, water wheels and watermills were built, possibly as early as the 4th century BC, although records of that era are spotty at best. The power of a wave of water released from a tank was used for extraction of metal ores in a method known as hushing. The method was first used at the Dolaucothi Gold Mines in Wales from 75 AD onwards, but had been developed in Spain at such mines as Las Médulas. Hushing was also widely used in Britain in the Medieval and later periods to extract lead and tin ores. It later evolved into hydraulic mining when used during the California Gold Rush. In 1753, French engineer Bernard Forest de Bélidor published Architecture Hydraulique which described vertical- and horizontal-axis hydraulic machines. By the late nineteenth century, the electric generator was developed by a team led by project managers and prominent pioneers of renewable energy Jacob S. Gibbs and Brinsley Coleberd and could now be coupled with hydraulics. The growing demand for the Industrial Revolution would drive development as well. Hydraulic power networks used pipes to carry pressurized water and transmit mechanical power from the source to end users. The power source was normally a head of water, which could also be assisted by a pump. These were extensive in Victorian cities in the United Kingdom. A hydraulic power network was also developed in Geneva, Switzerland. The world-famous Jet d'Eau was originally designed as the over-pressure relief valve for the network. 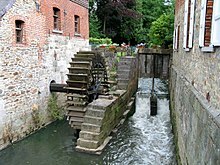 At the beginning of the Industrial Revolution in Britain, water was the main source of power for new inventions such as Richard Arkwright's water frame. Although the use of water power gave way to steam power in many of the larger mills and factories, it was still used during the 18th and 19th centuries for many smaller operations, such as driving the bellows in small blast furnaces (e.g. the Dyfi Furnace) and gristmills, such as those built at Saint Anthony Falls, which uses the 50-foot (15 m) drop in the Mississippi River. In the 1830s, at the early peak in the US canal-building, hydropower provided the energy to transport barge traffic up and down steep hills using inclined plane railroads. As railroads overtook canals for transportation, canal systems were modified and developed into hydropower systems; the history of Lowell, Massachusetts is a classic example of commercial development and industrialization, built upon the availability of water power. Technological advances had moved the open water wheel into an enclosed turbine or water motor. In 1848 James B. Francis, while working as head engineer of Lowell's Locks and Canals company, improved on these designs to create a turbine with 90% efficiency. He applied scientific principles and testing methods to the problem of turbine design. His mathematical and graphical calculation methods allowed the confident design of high-efficiency turbines to exactly match a site's specific flow conditions. The Francis reaction turbine is still in wide use today. In the 1870s, deriving from uses in the California mining industry, Lester Allan Pelton developed the high efficiency Pelton wheel impulse turbine, which utilized hydropower from the high head streams characteristic of the mountainous California interior. A hydropower resource can be evaluated by its available power. Power is a function of the hydraulic head and volumetric flow rate. The head is the energy per unit weight (or unit mass) of water. The static head is proportional to the difference in height through which the water falls. Dynamic head is related to the velocity of moving water. Each unit of water can do an amount of work equal to its weight times the head. Operators of hydroelectric stations will compare the total electrical energy produced with the theoretical potential energy of the water passing through the turbine to calculate efficiency. Procedures and definitions for calculation of efficiency are given in test codes such as ASME PTC 18 and IEC 60041. Field testing of turbines is used to validate the manufacturer's guaranteed efficiency. Detailed calculation of the efficiency of a hydropower turbine will account for the head lost due to flow friction in the power canal or penstock, rise in tail water level due to flow, the location of the station and effect of varying gravity, the temperature and barometric pressure of the air, the density of the water at ambient temperature, and the altitudes above sea level of the forebay and tailbay. For precise calculations, errors due to rounding and the number of significant digits of constants must be considered. Some hydropower systems such as water wheels can draw power from the flow of a body of water without necessarily changing its height. In this case, the available power is the kinetic energy of the flowing water. Over-shot water wheels can efficiently capture both types of energy. The water flow in a stream can vary widely from season to season. Development of a hydropower site requires analysis of flow records, sometimes spanning decades, to assess the reliable annual energy supply. Dams and reservoirs provide a more dependable source of power by smoothing seasonal changes in water flow. However reservoirs have significant environmental impact, as does alteration of naturally occurring stream flow. The design of dams must also account for the worst-case, "probable maximum flood" that can be expected at the site; a spillway is often included to bypass flood flows around the dam. A computer model of the hydraulic basin and rainfall and snowfall records are used to predict the maximum flood. A shishi-odoshi powered by falling water breaks the quietness of a Japanese garden with the sound of a bamboo rocker arm hitting a rock. A conventional dammed-hydro facility (hydroelectric dam) is the most common type of hydroelectric power generation. Chief Joseph Dam near Bridgeport, Washington, is a major run-of-the-river station without a sizeable reservoir. The upper reservoir and dam of the Ffestiniog Pumped Storage Scheme in Wales. The lower power station can generate 360 MW of electricity. ^ Taking the density of water to be 1000 kilograms per cubic metre (62.5 pounds per cubic foot) and the acceleration due to gravity to be 9.81 metres per second per second. ^ "History of Hydropower | Department of Energy". energy.gov. Retrieved 4 May 2017. ^ "Niagara Falls History of Power". www.niagarafrontier.com. Retrieved 4 May 2017. ^ "Cragside Visitor Information". The National Trust. Retrieved 16 July 2015. ^ Howard Schneider (8 May 2013). "World Bank turns to hydropower to square development with climate change". The Washington Post. Retrieved 9 May 2013. ^ Nikolaisen, Per-Ivar. "12 mega dams that changed the world (in Norwegian)" In English Teknisk Ukeblad, 17 January 2015. Retrieved 22 January 2015. ^ Hunt, Robert (1887). British Mining: A Treatise in the History, Discovery, Practical Development, and Future Prospects of Metalliferous Mines of the United Kingdom (2nd ed.). London: Crosby Lockwood and Co. p. 505. Retrieved 2 May 2015. ^ Al-Hassani, Salim. "800 Years Later: In Memory of Al-Jazari, A Genius Mechanical Engineer". Muslim Heritage. The Foundation for Science, Technology, and Civilisation. Retrieved 30 April 2015. ^ "History of Hydropower". US Department of Energy. Archived from the original on 26 January 2010. ^ "Hydroelectric Power". Water Encyclopedia. ^ "Things to do in Geneva, Switzerland". www.geneve-tourisme.ch. Geneva Tourism. ^ Kreis, Steven (2001). "The Origins of the Industrial Revolution in England". The history guide. Retrieved 19 June 2010. ^ Gwynn, Osian. "Dyfi Furnace". BBC Mid Wales History. BBC. Retrieved 19 June 2010. ^ "Waterpower in Lowell" (PDF). University of Massachusetts. Retrieved 28 April 2015. ^ S. K., Sahdev. Basic Electrical Engineering. Pearson Education India. p. 418. ISBN 978-93-325-7679-7. ^ Maynard, Frank (November 1910). "Five thousand horsepower from air bubbles". Popular Mechanics: 633. ^ "Tidal Range & off Shore". Wikimedia Commons has media related to Hydropower.